The United States Geological Survey (USGS) recently posted online two moon maps — a photo mosaic and a topographic map — that were constructed using images and data captured by NASA's long-running Lunar Reconnaissance Orbiter (LRO) spacecraft. 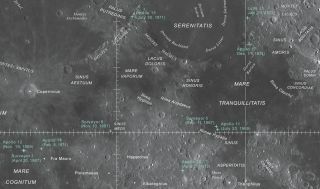 The new maps are an improvement over the old 1979 Lunar Chart, featuring high-resolution images that cover the entire surface of the moon, USGS officials said. "These maps were designed to help both the public and scientists understand the overall appearance and topography of the moon," USGS officials wrote in a statement. "Viewers can locate features of interest, including Apollo landing sites and specific impact craters. Amateur astronomers can use the maps to directly compare what they see through their telescopes to features on the map." A new moon map based on images from the Lunar Reconnaissance Orbiter's wide-angle camera. The image mosaic is based on photos taken by LRO's wide-angle camera and shows physical features such as volcanoes and craters. The topographic map shows elevations on the moon using data from the spacecraft's Lunar Orbiter Laser Altimeter, ranging from blue (low altitudes) to gray (higher altitudes). A new moon map based on altimeter data from the Lunar Reconnaissance Orbiter. "Images from the LRO Camera have greatly advanced our knowledge of the moon," LRO Camera principal investigator Mark Robinson, of Arizona State University, said in the same statement. "High-resolution images have revealed very young lunar volcanoes 10 to 100 million years old, contrary to conventional wisdom, which suggests that lunar volcanism ceased between one and two billion years ago," Robinson added. A map, based on Lunar Reconnaissance Orbiter data, showing an image of the moon (left) and its topography (right). The image at left was stretched to emphasize the mare, or low-lying areas formed by volcanic eruptions. The solar-powered LRO spacecraft has been studying the moon from lunar orbit since 2009. The car-size probe has characterized how much ice is available on the lunar surface and has tracked down fresh craters from new lunar impacts, among other accomplishments. The highest spots (left) and lowest spots (right) on the moon, based on data from NASA's Lunar Reconnaissance Orbiter. The $504 million LRO mission is currently funded through October 2016. You can view the maps online here: http://pubs.er.usgs.gov/publication/sim3316.